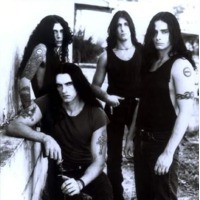 Type O Negative is a heavy metal band from Brooklyn, New York City. Although commonly viewed as a gothic metal band, Type O has also incorporated elements of doom metal and thrash metal. Their dramatic lyrical emphasis on themes of romance, depression, and death has resulted in the nickname "The Drab Four" (in homage to The Beatles' "Fab Four" moniker). The band went Platinum with 1993's Bloody Kisses, and Gold with 1996's October Rust, and has gained an enormous following with seven studio albums, two best-of compilations, and concert DVDs. Their most recent album is 2007's Dead Again. On April 14, 2010, lead vocalist, bassist, and principal songwriter Peter Steele died, reportedly from heart failure. The future of the band is not known at this time.